The future generations of nanotechnology will rely on being able to effectively arrange atoms. Molecular manufacturing, and the use of molecular assemblers to hold and position molecules, will be key to the future, controlling how molecules react and allowing scientists to build complex structures with atomically precise control. In this essay, Dr. Drexler discusses the benefits and challenges of future molecular manufacturing. Originally published on EurekaAlert! April 2003. Published on KurzweilAI.net April 14, 2003. The future of technology is sometimes easy to predict. Computers will compute faster, materials will become stronger, and medicine will cure more diseases. Nanotechnology, which works on the nanometer scale of molecules and atoms, will be a large part of this future, enabling great improvements in all these fields. Advanced nanotechnology will work with molecular precision, making a wide range of products that are impossible to make today. A proposed fine-motion controller for guiding molecular assembly. Molecular machinery driving rotation of the blue rings (below) would move the tool-holder (above) with precise control of angle and position. Why focus on molecular manufacturing? Every manufacturing method is a method for arranging atoms. Most methods arrange atoms crudely; even the finest commercial microchips are grossly irregular at the atomic scale, and much of today’s nanotechnology faces the same limit. Chemistry and biology, however, make molecules defined by particular arrangements of atoms—always the same numbers, kinds, and linkages. Chemists use clever tricks that don’t scale up well. Biology, however, uses a more powerful method: cells contain molecular machines that read genetic data to guide the assembly of large molecules (proteins) that they serve as parts of molecular machines. Molecular manufacturing will likewise use stored data to guide construction work done by molecular machines, greatly extending abilities in nanotechnology. The basic idea is simple: where chemists mix molecules in solution, allowing them to wander and bump together at random, molecular assemblers will instead position molecules, bringing them together to the specific location at the desired time. Letting molecules bump at random leads to unwanted reactions—a problem that grows worse as products get larger. By holding and positioning molecules, assemblers will control how the molecules react, building up complex structures with atomically precise control. 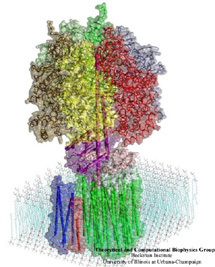 The energy-carrying molecule ATP is manufactured by a molecular machine, ATPase, mounted in a membrane. The lower part is a motor powered by protons flowing through it across the membrane; the motor turns a shaft that drives the mechanosynthesis of ATP in the upper part. Picture an industrial robot arm standing next to an unfinished work piece. A conveyor belt supplies the arm with parts, each mounted on a handle. Step after step, the belt advances, the robot grips a fresh handle, plugs the attached part into the work piece, then puts the empty handle back on the belt. Eventually, the work piece is finished and another belt moves it away, shifting a new unfinished work piece into place. To picture a molecular assembler in a manufacturing system, imagine that all the parts are measured in nanometers, and that the transferred parts are just a few atoms, shifting from handle to work piece through a chemical reaction at a specific site. An assembler works as part of a larger system that prepares tools, puts them on the conveyor, and controls the robotic positioning mechanism. This will be a complex system that no one will build any time soon. Indeed, no one is even trying to build molecular assemblers today, because nanotechnology is still in its infancy. We can see a path to assemblers, just as the rocketry pioneers of the 1930s and 1940s could see a path to the Moon. But like those pioneers, we aren’t ready to attempt the final goal. They knew they must first launch many satellites, just as we must first build many molecular machines. While nano assembly has been described as "building things atom by atom," an expression that has caught on in the press, this is a misconception. Molecular assemblers will build with atomic precision by mechanically guiding chemical reactions that typically add a few atoms at a time, but some researchers have criticized this misconception as if it were the actual proposal. It is correct that assemblers can’t build things by using tiny tweezers to pick up and put down atoms one at a time, but even from the start this was never the idea. The apparent controversy over "molecular assemblers" is thus an illusion: the critics are talking about something else. The idea of building things by mechanically guiding chemical reactions has withstood scientific scrutiny for over 20 years, and seems sound. It is time to move on, to consider the consequences of molecular assemblers and what they will be able to build. We can catch a glimpse of future technologies because we sometimes can understand things that we can’t yet build. Chemistry, biology, engineering, and applied physics all provide useful perspectives. Chemistry shows what can happen when reactive molecules meet. By using molecular machinery to guide reactive molecules, similar structures can be built at larger scales. The products can be stronger, tougher, and more capable than the delicate structures found in living cells. 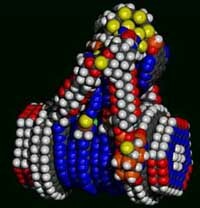 Biology shows that molecular machines can exist, can be programmed with genetic data, and can build more molecular machines. Biology shows that the products of molecular machine systems can be as cheap as potatoes. Molecular manufacturing will make a far wider range of products for similarly low costs. Engineering shows that strong, precise parts can be combined to make computers, robots, and a host of useful gadgets. Applied physics, aided by computer modeling, shows that these sorts of devices can be built from atomically precise parts of nanometer scale. These glimpses of future technologies are enough to establish the potential for molecular manufacturing. Molecular manufacturing will bring both great opportunities and great dangers. Nanocomputers will extend desktop computational power by a factor of a billion or more. Nanoscale sensors, computers, and tools will bring surgical control to the molecular level, enabling a revolution in medicine. Light, strong, and inexpensive aerospace structures will make spaceflight easy. But the future’s faster, cheaper, cleaner production of better products will also bring disruption. Advanced lethal and nonlethal weapons, deployed quickly and cheaply, could make the world a more dangerous place. The list of consequences is long, much of it sounding like science fiction. The tools required to develop nanotechnologies are typically small and unobtrusive. The pace of research is accelerating worldwide. Some suggest stopping it, but it is hard to imagine how. Thus, it seems that this technology, with all its challenges and opportunities, is an unavoidable part of our future. Sponsored by the U.S. Department of Energy. For more information about nanotechnology, visit EurekAlert!’s Nanotechnology In-Context Module. © 2002 American Association for the Advancement of Science. Reprinted with permission.